This is quite a different "golden milk" than the one in my previous post. Definitely none of its ingredients belongs to the category health food. But MIND OVER MATTER: Christine's homemade eggnog is so delicious (added to any dessert) that it certainly does have a positive effect on well-being. When I asked her to pass the recipe on to my readers, she popped up in my kitchen with a basket full of her preferred ingredients ready to give me the masterclass. Slowly bring the milk, the sugar and the vanilla to a boil, continuously stirring. Let the mixture cool to room temperature. Separate the egg-whites from the yolks, discard the whites. Pour the sweet vanilla milk into the blender. 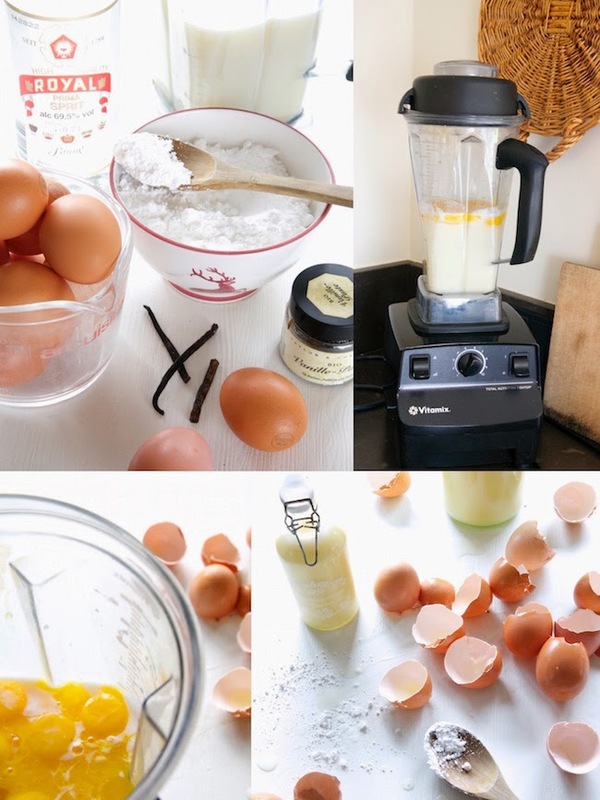 Run the blender at lowest speed and add the yolks. Once they are blended in, slowly add the spirit in a fine and even stream. That's it! The eggnog should be stored in a cool and dark place. If you keep it in the fridge it will become quite solid after a while.